Is a warmer climate making pollen allergies worse? Can increased flooding due to climate change exacerbate disease outbreaks? How else can climate change influence weather and climate patterns that affect our health? In the midst of sometimes overwhelming information transmitted through the media, most Americans do not realize how weather extremes and climate variability can have important impacts on their health. When asked to identify how climate change impacts health, less than a third of those surveyed can identify even one way it affects human health. However, climate change is expected to have a varied and complex toll on human health, contributing to changes in heat stress, malnutrition, and the spread of certain infectious diseases, like malaria. These impacts are essential for students to comprehend to protect both their own health and their community’s health. Advancing this understanding will also help educators achieve their science, technology, engineering, and math (STEM) educational goals. This module follows the 5E instructional model [Engage, Explore, Explain, Elaborate, Evaluate] to promote student discovery and learning about the complex interactions between climate change, the environment, and human health. This 5E instructional model aligns with the National Research Council’s Framework for K-12 Science Education, integrating multiple science and engineering practices, disciplinary core ideas, and cross cutting concepts. The module also integrates the essential principles of climate science outlined in Climate Literacy: The Essential Principles of Climate Science. Using content from the U.S. Global Change Research Program’s 2016 report, The Impacts of Climate Change on Human Health in the United States: A Scientific Assessment (CHA, 2016), students are prompted to describe the impacts of changing climatic conditions on human health with an emphasis on vulnerable populations. 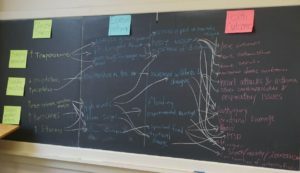 Students apply systems thinking to create a visual model of the health implications arising from climate change. Students are introduced to the diverse “climate drivers” that influence health, such as changing temperature, precipitation, and weather patterns. 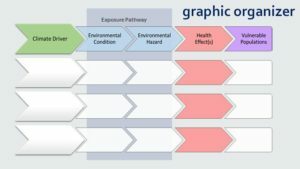 They are then lead to complete a graphic model, showing how specific climate drivers cause environmental hazards that harm health (See Figure 1). For example, a visual model of this may show the pathway from increased precipitation to flooding, which causes increased nutrient runoff leading to higher rates of algal blooms and water-related infections. These visual models help students understand the chain of connections between climate change and their health (See Figure 2). 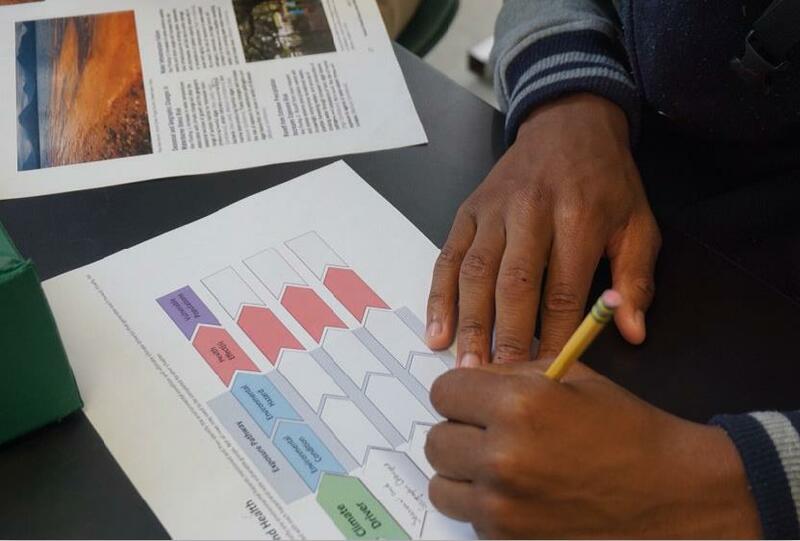 As students consider the numerous health effects of a changing climate, they are encouraged to extend their learning to design resilience projects in their school or community. For example, lessons guide students to look at how elderly relatives might be assisted during heat waves. Students are challenged to think about disease prevention, such as how to eliminate breeding sites for mosquitoes, since these disease vectors will present new health risks to the community as the climate changes. Taking this a step further, students are encouraged to advocate for adaptation strategies or resilience building projects through civic engagement with relevant policymakers. Prior to its public release, the module was piloted with seven classes and approximately 175 North Carolina high school students from June through September of 2016. Each pilot enabled refinement of the module, and was well received by teachers and students alike. Teachers expressed enthusiasm that their students were introduced to a variety of new concepts, including climate change, health impacts, and mitigation and adaptation strategies (solutions). Teachers valued seeing their students develop skills in elaboration, while cultivating systems-level thinking to understand interactions between the atmosphere, hydrosphere, and biosphere. Positive feedback was also received from students, who like working with peers to complete the graphic organizer and the interactive construction of the visual models. Students valued the emphasis on how climate change is relevant to their lives, looking at local hazards (e.g. extreme heat) and specific impacts on their lives (e.g. August sports practices). By applying this knowledge, students appreciated the detailed discussion of climate change solutions, and steps they can take to address related problems. National and international assessments have concluded that the health risks from climate change are expected to increase in coming years due to the exacerbation of existing health threats and creation of new public health challenges. But research shows that educating kids about health concerns is a great way to improve their health, as well as the health of those around them. For example, teaching kids about the harmful effects of smoking discourages them, and their parents, from developing or continuing this unhealthy habit. Similarly, teaching kids about the importance of wearing a seat belt can lead to life-saving decisions in the future. We hope that adding health to climate change education, through use of modules like this one, will enhance both science abilities and health for the next generation. Ultimately, our hope is that this module will enhance student interest in STEM issues and climate literacy, while students gain skills they can apply in the real world. Describe how climatic conditions are changing in response to a warming climate. Describe the impacts of these changing climatic conditions on human health with emphasis on vulnerable populations. Demonstrate understanding of the complexities of the climate change-health effect system through construction of visual models. Describe the health co-benefits of climate change mitigation. Describe and evaluate adaptation strategies to protect human health. John Balbus, M.D., M.P.H. serves as Senior Advisor for Public Health to the Director of the National Institute of Environmental Health Sciences (NIEHS), where he also directs the NIEHS-WHO Collaborating Centre for Environmental Health Sciences. He serves as the Department of Health and Human Services Principal to the U.S. Global Change Research Program and also co-chairs working groups on Climate Change and Human Health for the U.S. Global Change Research Program and for the National Institutes of Health. Tara Failey, M.P.H. is a Public Health Specialist for MDB, Inc., a contractor supporting the National Institute of Environmental Health Sciences. Ms. Failey previously worked at the U.S. Global Change Research Program in the Communication and Education Division.